Falling while working at height represents the number one cause of death in the construction industry and the number two cause in general industry. Experience has shown us that people seem to be making the same fundamental mistakes while managing work at height. The objective of this series is to share our observations, in order to correct these deficiencies and develop better practices while working at height. Personal Fall Protection Systems (PFPS) are comprised of 3 components. It’s essential to understand not only the requirements of each component, but just as importantly, how the components work together as a system. A PFPS is a system of 3 singular items working together to keep the worker safe. Like a chain, if the end user selects an incorrect component, or there is an incompatible connection, the link fails and the chain breaks. It’s critical that the end user understand each of the components. It’s also recommended that the components come from the same manufacturer. When we select personal protective equipment as our control measure, it’s automatically thought that the equipment will be configured in a fall arrest mode. That doesn’t have to be the case. A permanent anchor would be installed in a location where a worker would regularly work (providing we can’t redesign the work, install a guardrail or use fall restraint). 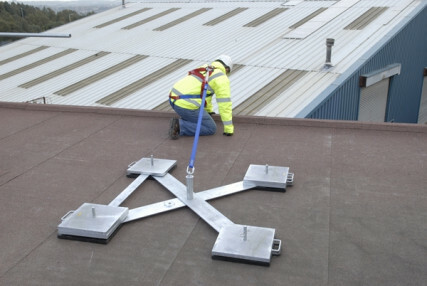 A temporary anchor would be installed in a location where a worker would rarely go, or with a task of a short duration (e.g. where it would take longer to install an anchor than to do the actual job). Note: Remember the maximum arrest force (MAF) allowed is 1,800 lbs. 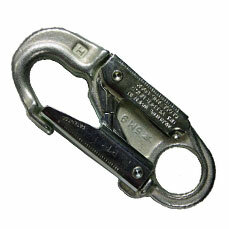 The shape of the fall arrest anchor must be compatible with the snap hook that attaches to it. 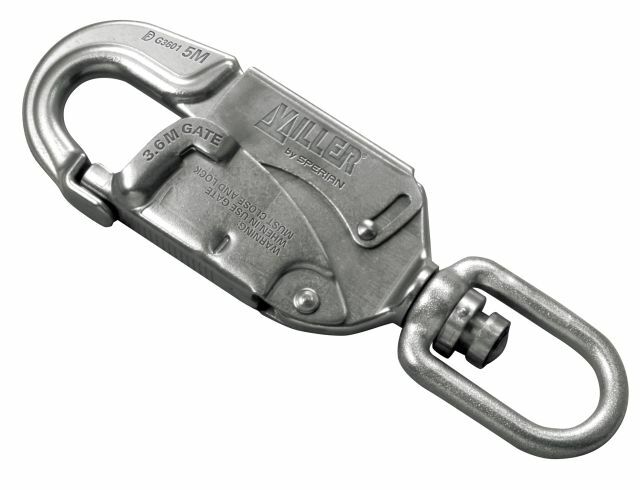 The “rule of thumb” says, if the snap hook cannot pass through the anchor hardware, then the possibility exists that the snap hook gate can be overloaded and “burst out”. The snap hook gate (or keeper) can be overloaded and “burst out” if the anchor point and snap hook are not compatibly shaped. Always check for compatibility by attempting to pass the snap hook through the anchor hardware. If it won’t pass through, don’t connect. This problem has been partially alleviated with the latest version of the ANSI Z359 standard. This standard requires that snap hook gates be rated for 3,600lbs in any direction. Keep in mind that the ANSI standard is voluntary and the older style snap hooks may still exist. 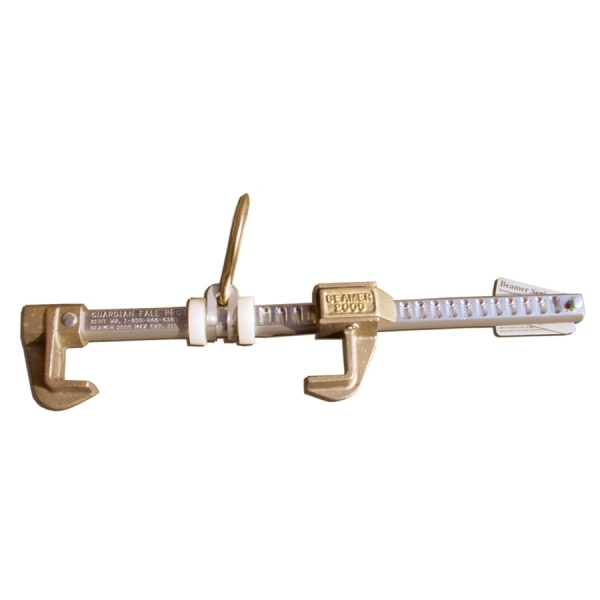 Traditional snap hook with the gate rated to the previous ANSI Z359 standard. The gate was designed to hold a load of 220lbs to the face and 350 lbs to the side. The current ANSI Z359 standard requires that the gate on the snap hook be designed so that it will hold a load of up to 3,600lbs. With this snap hook, shape is no longer an issue. Walking out from under your anchor could cause you to swing should you fall. You could hit a wall or column. This is also called the “pendulum effect”. 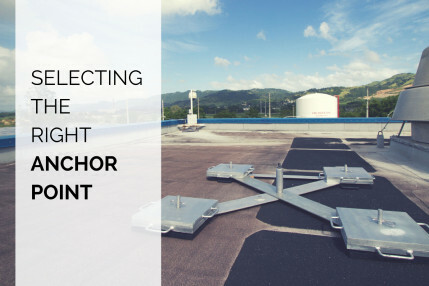 Always attempt to connect to an anchor directly overhead. Typical connecting devices (i.e. shock absorbing lanyards, retractables, etc) are designed to be used in a fall arrest system that doesn't exceed a 6 foot free fall. 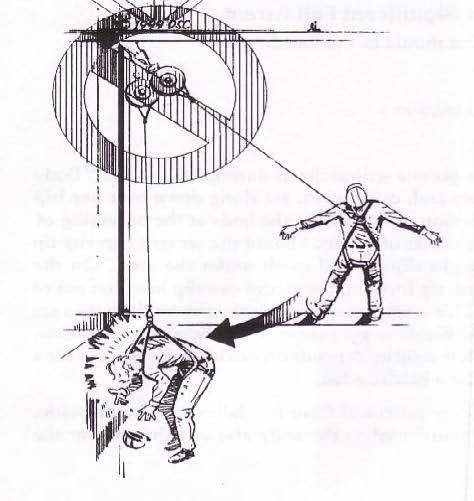 For example, an iron worker that needs to use the beam at his feet as anchor point, would experience an approximate free fall of 12 feet. "Standard" shock absorbing lanyards or retractables are not designed to experience free falls of this magnitude. The problem lies in the fact that many real world applications (like the one described above) require anchor points below the harness dorsal D Ring. This means exceeding free falls of 6 feet. Manufacturers have designed products (examples include the Miller Max shock absorbing lanyard and the DBI Sala Nano-Lok Edge retractable lifeline) that are equipped to experience free falls up to 12 feet. End users need to be trained so that they understand the limitations of their equipment and how to select the correct equipment for the task with which they're involved. Finally, anchors should be installed in a location where the end user isn’t put at risk in order to attach to the anchor. Anchors should be installed in a position that would assist you, rather than hinder you, in a rescue attempt. 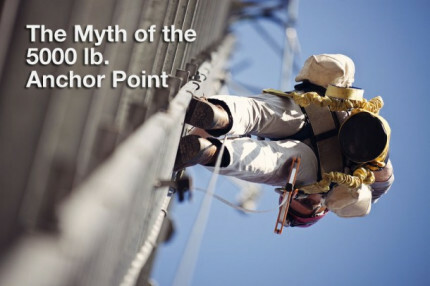 Choosing the right anchor point can be difficult. 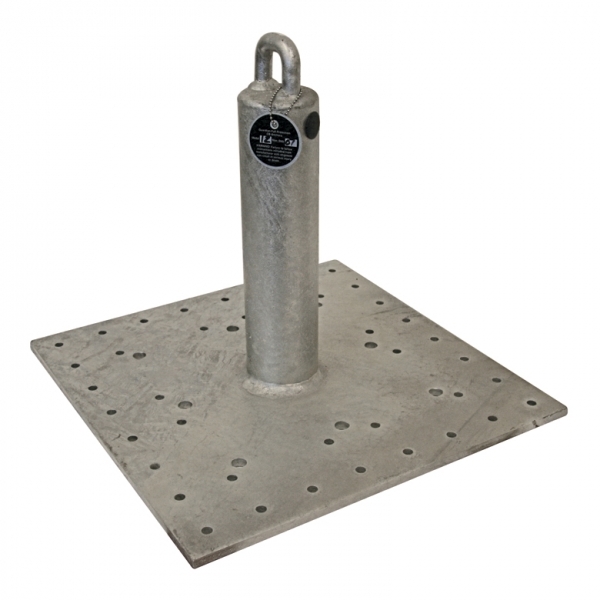 The main criteria most people look for when shopping for an anchor point is that it will withstand a 5000 lbs. load.